A new study has found that the number of American teenagers using Facebook is dropping. Many turn instead to YouTube, Instagram and Snapchat. The study by the U.S.-based Pew Research Center found that 51 percent of American teens between the ages of 13 to 17 said they currently use Facebook. This was a large drop from 2015, when 71 percent of teens in that age group reported using the social media service. The study found that YouTube is now the most popular internet service for teens, with 85 percent saying they currently use it. The second-most popular is Instagram, at 72 percent. Facebook owns Instagram. Sixty-nine percent of teens said they use Snapchat, while 32 percent use Twitter. Less than 10 percent reported using Tumblr or Reddit. In March, another Pew study found that 68 percent of adults said they were Facebook users. Of those, 74 percent said they used the social media service daily. About half of the adults reported using Facebook several times a day. Results of the latest study were based on interviews with 743 teens and more than 1,000 parents during March and April 2018. The study also found that 95 percent of teens reported they either owned a smartphone or had a way of using one. This marked a 22 percent increase over a similar study from 2015. When asked which services they use most often, 35 percent of teens identified Snapchat. About 32 percent said they use YouTube the most, while 15 percent said they use Instagram more than other services. The Pew study found that, in general, teens from different economic and racial backgrounds liked the same services. However, the researchers did find some differences. For example, about 70 percent of teens whose families earned less than $30,000 a year said they used Facebook. Among teens from families making over $75,000, just 36 percent of teens reported using it. There were also some differences among males and females. The study found that about 42 percent of girls said Snapchat was the service they used most, compared to 29 percent of boys. More males – 39 percent – said they used YouTube the most, compared to 25 percent of females. Pew’s latest study also confirmed earlier research that a huge majority of teens like to spend time gaming. When asked whether they ever play video games -- either on a computer, a game machine or phone -- 90 percent answered yes. 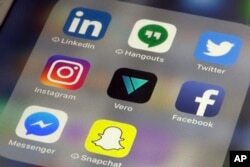 The marketing research company eMarketer noted in a report earlier this year that Facebook was losing younger users at a much faster rate than experts had predicted. The company’s research showed that in 2018, less than half of U.S. internet users aged 12 to 17 used Facebook on any device at least once a month. eMarketer said that even younger users would be signing off Facebook in 2018. It predicted a 9 percent decrease in users aged 11 and younger. The company said Facebook can expect to lose up to 2 million users aged 24 and younger in 2018. The company also predicted about 1.6 million users 24 years and younger will be joining Facebook-owned Instagram in 2018. But another 1.9 million are expected to move over to Snapchat, the company said.